Posted on Thu, Mar 29, 2012 : 1:20 p.m.
Thirty hours ago, Shawn Hunwick, former goalie for the Michigan hockey team, was in bed with nothing to do until an afternoon astronomy class. Now, he's officially an NHL player. 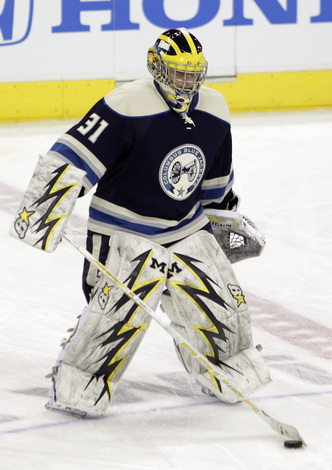 Columbus Blue Jackets backup goalie Shawn Hunwick may face his brother, Colorado Avalanche defenseman Matt Hunwick, when Columbus plays at Colorado on April 5. Hunwick, who filled in as a backup for the Columbus Blue Jackets on Wednesday on an amateur tryout contract, signed a deal to stay with the club through the remainder of the 2012 season the team announced Thursday. Columbus — the worst team in the NHL — trails the second-to-last place Edmonton Oilers by 14 points in the standings with five games left in the regular season. The Blue Jackets play at the Colorado Avalanche on April 5. Hunwick's brother, Matt Hunwick, is a defenseman for the Avalanche. Hunwick's father, Rich Hunwick, could not make it down to Columbus on Wednesday for Shawn's first game as a backup, but said he would definitely be in Denver if his sons were to face each other. Not all the news for Hunwick was good Wednesday. A top-10 candidate for the Hobey Baker Award, he was not among the top three finalists for the award, which will be handed out at next week's Frozen Four in Tampa, Fla.